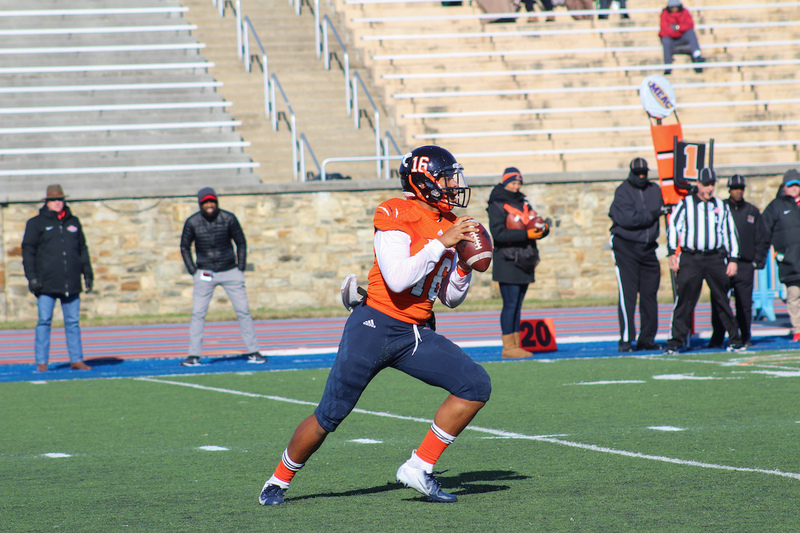 BALTIMORE, MD–It was a slugfest in Baltimore as Delaware State and Morgan State faced off in Hughes Stadium on Senior Day. The Bears avoided going winless at home this season by winning, 9-0. It was scoreless early on in the game until Joshua Chase popped off a 75-yard rushing touchdown in the second quarter. MSU failed on the two-point conversion and luckily, the Hornets did not capitalize on the one possession score. The Bears added a field goal in the third quarter to end the scoring for the day. It was rough for both teams but some Bears had some offensive success. DJ Golatt from PG County, MD had his first full start for MSU. He went 9 for 23 with 113 yards. His completions when needed, helped out the MSU rushing game. Coach Ernest T. Jones is adamant on running the ball and the Bears executed his plans for sure. They outgained the Hornets, 253 to 65 yards rushing. Joshua Chase had a career-high 145 yards on 18 carries for the Bears. David Adeleke added 55 crucial yards towards the end of the game as Chase left the game with an injury. The Bears defense took the breath out of the Hornets with two forced fumbles by Ayodeji Agbelese and Ian McBorrough. Rico Kennedy had two of MSU’s four sacks on the day. Damare Whitaker led the team with seven tackles. Up next for Morgan State will be a road test against Norfolk State, who’s coming off a big win against Howard. Delaware State will host Virginia Lynchburg next week at home.